The Juggler by David Bush is a fine art poster displaying a childish illustration of a man juggling the planets and stars. This circus like poster has a vintage feel and is composed in an array of vibrant colors. This piece would fit a child's room and spur imagination and growth. and the stillness of the landscape that surrounds his studio in rural Pennsylvania. He invites us to a contemplative space and time beyond the material world. Born in California, his artistic formative years were spent throughout the continental United States and Hawaii but grounded in the rich history of Newport, Rhode Island. Strong modern Danish, Japanese and Latin influences also helped define David's strong contemporary language to express concepts borne out of otherwise classic points of view. David's extensive and successful graphic design and illustration career is marked by key clients such as Disney, Warner Bros., Scripps Howard, and Viacom. The trend forward influence of designing content for these key media players defines the foundation of the non-conformist spirit of David's work, marking the symbolic meaning and concepts associated with image making and design. 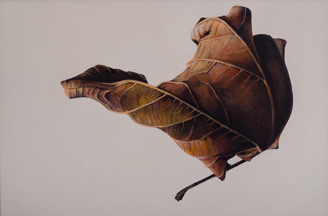 Autumn in Space by David Bush is a fine art painting of a dried maple leaf suspended in zero gravity. This warm oil painting is composed in a palette of rich browns with hints of red on a light gray background. This piece accents wood décor and is a beautiful addition to the dining room or living room. 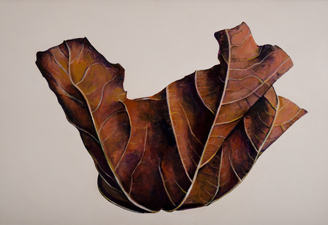 Autumn's Cloak by David Bush captures the fragility of dry fall leaves in shades of brown and red on a white background. This original art celebrates crisp fall weather through its rich tones and delicate framing. 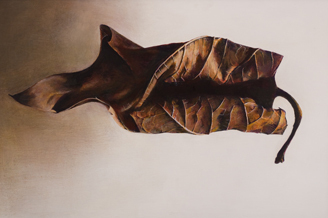 I Turn Inward by David Bush is an introspective painting of a dry fall leaf curled in on itself in a strangely vulnerable way. The artist brings life to the lifeless and reminds us of the renewal of the earth we live in. The leaf is portrayed in a multi-layered spectrum with minimalist lines and borders to highlight the contemporary movement of this unique wall art for your home.